3Rs remediation/supplementary teaching in AP Schools-3Rs Remediation Programme in primary schools, 3Rs Assessment Test to facilitate 3R remediation/supplementary teaching in AP Schools: 3Rs Assessment Test Instructions, 3R Assessment Tool, 3Rs Question Papers, 3R remediation/ supplementary teaching, 3Rs (Reading, Writing and Arithmetic) assessment, Remediation program: 3Rs Assessment Test to be conducted in December, in place of Formative Assessment 3(FA 3) for the students of Classes 2 to 5 studying in all AP Schools. 3Rs (Reading, Writing and Arithmetic) assessment for students from 2 - 5 classes in Telugu, English and Mathematics. 3Rs Assessment is to assess the learning levels of primary school students and to facilitate 3R remediation/supplementary teaching for those identified for low performance. The 3R Assessment Tool will be provided from State level, the valuation of the same will be done at the school level by the teachers. Rc.No.12,Dated:02-02-2017: Sub: PEMANDU lab initiative – 3Rs assessment test results analyzed- Areas of remediation identified – SCERT planned to Conduct 3Rs Remediation Programme in Primary Schools – conduct of 5 days workshop from 06.02.2017 to 10.02.2017 at Vijayawada-Deputation of State Resource Persons to attend the workshop-Orders issued. Sub: PEMANDU lab initiative - 3Rs assessment test results analyzed Areas of remediation identified - SCERT planned to Conduct 3Rs Remediation programme in primary schools - conduct of 5 days workshop from 23.01.17 to 27.01.17 at SCERT, Vijayawada -Deputation of State Resource Persons to attend the workshop Orders issued - Reg. Ref: 1. PEMANDU lab draft report submitted in May 2016. The attention of the District Educational Officers and Project Officers of SSA of all districts in A.P is invited to the subject read above, wherein it is informed that analysis of the 3Rs assessment test conducted in December 2016 is under process at SCERT with the support of SSA, CSSL and SAMAGRA teams in association with AP Online services. In this connection it is informed that as a part of implementation of. PEMANDU lab initiatives in the reference 1st cited I it is planned to conduct 3R (Reading, Writing and arithmetic) remediation programme for 50 days in all Primary schools which is expected to be initiated in February 2017. In this regard it is planned to conduct .a 5 day workshop from 23.01.17 to 27.01.17 at SCERT office, 2nd floor, .B- Block, Anjaneya Towers, Ibrahim Patnam, Vijayawada to develop the remedial material for the remediation programme. Hence the District Educational Officers and the Project Officers of SSA of all districts are requested to relieve the State Resource Persons shown in the annexure, to attend the above said workshop. To The District Educational Officers of all districts The Project Officers of SSA of all districts Copy submitted to the Commissioner of School Education; A.P for information Copy to State Project Director, SSA with request to depute concerned Person annexed. Sub: Elementary Education – PEMANDU lab initiatives - Conduct of 3Rs assessment survey in Primary Schools in A.P – Queries from different districts regarding test administration - Certain clarifications issued - Reg. The kind attention of all the District Educational Officers and all the District level officers of School Education Dept is invited to the subject read above wherein certain clarifications are issued through these proceedings, in response to the queries from different personnel across the state over phone mentioned in the reference 3 read above, regarding SLAS and 3Rs test administration. The evaluators should pack question papers and OMRs in separately and submit to MRCs. MEOs should ensure proper labeling of packs with school names/codes. The collected OMR bundles and question paper bundles should be sent to DCEB Secretaries. DCEB Secretaries soon after collection of bundles from MEOs should parcel them by 17.12.2016 in the following manner. b. Question paper bundles to SCERT, 2nd floor, B-bock, Anjaneya Towers, Ibrahimpatnam, Vijayawada. There is no evaluation of SLAS TEST papers in sampling as well as in non-sampling (census) schools. However, Teachers should be instructed to post the students’ responses in the table given below the students’ information sheet in the question paper, as per the instructions given in the same page, for the data entry convenience of AP online services. Likewise the evaluators of sample schools should also be instructed to do so for class V students in SLAS. It is requested to communicate the above clarification to the field before the Mandal Level Trainings take place on 13.12.2016. Utilize the services of CRPs to obtain the attendance status of students as well as teachers of all P.S and UPS schools in all types of managements for consolidation and reporting to the DSE, SCERT and SSA on the days of assessment survey. Rc.No.06, Dt,13.12.2016: Sub: Elementary Education - Postponement of 3Rs assessment Survey Test Administration due to rains-Postponed from 14.12.2016 and 15.12.2016 to 16.12.2016 and 17.12.2016 - Orders issued-Reg. CSE AP, RC.No. 06, Dated: 17.11.2016: Sub: School Education - PEMANDU lab initiatives - Conduct of 3Rs assessment test to 2nd to 5th classes as a part of Formative Assessment 3 - Certain instructions issued - Reg. Ref: 1. PEMANDU lab draft report, 2. Govt. Memo No. 3620951/Prog.ll/Al/2016 dt: 31.10.2016 of the Principal Secretary to Govt., School Education. 3. Lr. RC.No. 06/C/C&T/SCERT/2016 Dt: 07.11.2016 of the Commissioner of School Education, A.P. The attention of all the District Educational Officers, DIET Principals and Project officers of SSA is invited to the subject read above. As a part of implementing PEMANDU lab initiatives read in reference 1, Govt. of Andhra Pradesh vide Govt Memo dated 31.10.16 has directed Commissioner School Education& SPD, SSA, to conduct 3Rs (Reading, Writing and Arithmetic) assessment for students from 2 - 5 classes in Telugu, English and Mathematics. In the above context, it is proposed to conduct 3Rs Assessment Test tentatively on 28.11.2016, in place of Formative Assessment3 (FA 3) for the students of Classes 2 to 5 studying in Primary and Upper Primary schools, under all managements, including Govt. and Private Aided and Unaided, in Andhra Pradesh. The twin objectives of conducting 3Rs Assessment is to assess the learning levels of primary school students in AP State and to facilitate 3R remediation/supplementary teaching for those identified for low performance. While the 3R Assessment Tool will be provided from State level, the valuation of the same will be done at the school level by the teachers. On completion of the 3R Assessment and obtaining the analytical reports, it is proposed to provide intensive remediation to such students who need the same and who are studying in Government managed schools. The remediation program to be delivered to them will be designed by SCERT based on the analytics of the 3R Assessment. Private schools management may also be encouraged and instructed to conduct the required remediation program for low performing students. It is expected that the learning outcomes of students who had undergone the remediation will show improved performance in the Summative Assessment 3 (SA3) in April 2017. If required, students needing further remediation will be provided the same during the summer vacation 2017, so as to make them better prepared for the next higher class. Instructions regarding the process and schedule for conduct of 3Rs will be issued separately along with the Assessment Tool. All DEOs, Principals of DIETs and POs of SSA,DCEB Secretaries will be oriented well in advance in this regard. Hence, it is requested that all the District Educational Officers should take necessary measures and instruct the Mandal Educational Officers not to conduct the scheduled F.A- 3 (slip test) in Telugu, English and Mathematics subjects for Classes 2 to 5. And instead conduct the 3R Assessment as per instructions to be issued soon. 1. 3Rs assessment test will be conducted for classes 2 to 5 in Telugu, English and Mathematics in place of Formative Assessment - 3 (F.A - 3) that is scheduled to be conducted later in November 2016. 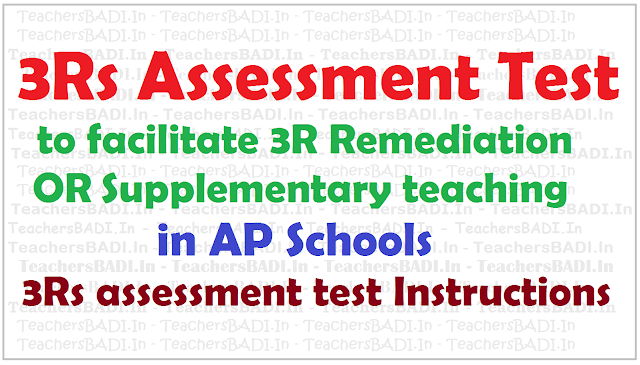 3Rs assessment will test Telugu, English and Mathematics subjects of Classes 2 & 3 and English of classes 4 & 5. The Telugu and Mathematics of Classes 4 and 5 are to be assessed by another standardized tool. 3. The 3Rs Assessment will be conducted by the School Teachers in their respective schools only. The Head Masters/Principals should get the papers evaluated by jumbling the duties of the teachers with in the school. In case of Single Teacher Schools, care should be taken to validate 5% of the Assessments done by external evaluators. 4. The marks of 3Rs assessment in each subject should be recorded under slip test category of F.A- 3 in CCE records and registers. 5. Though the 3Rs question paper will contain more than 20 questions, the teachers will have to proportionately reduce the marks to 20 while posting under slip test. 6. The subject Environmental Science (EVS) for classes 1 to 5 shall be conducted with teacher prepared question papers. 7. Separate instructions will be issued along with the 3Rs Assessment & additional Standardized Tool on the procedure to be followed for conduct of test. 8. The 3R Assessment results shall be uploaded online using AP online services. The results would be used to diagnose the students who need remediation, and the remediation programme will be conducted subsequently in the coming months.